Lightspeed Systems has recently released versions 3 of the Web Filter and the Rocket. This is the biggest Web Filter release to date with over 100 improvements and tons of new features. Key advancements include visual improvements, navigational changes, and the addition of various new settings and options. This guide will go over each aspect of the Web Filter 3 and Rocket 3 administration and will identify all relevant changes. Please make sure that you have upgraded to Web Filter 3 and Rocket 3 before beginning. This course will focus on general changes as well as specific changes to particular settings. You can assume that any setting not mentioned in this course did not significantly change from Web Filter 2 to Web Filter 3. Please review our Web Filter in 60 Minutes course for additional introductory information about using the Lightspeed Systems Web Filter 3. The new and improved Lightspeed Systems Web Filter 3. Web Filter 3’s notification center gives you instant news on network issues. Click the bell icon in the top right corner of your dashboard to get a quick list of all your notifications, or quickly scan the System Health widget — if any services are down, they’ll immediately jump to the top of the list and display a red icon. You can also get alerts by signing up for notification emails. In your account’s profile settings, navigate to the dropdown menu next to Notifications, and select Log and Email Alerts, and then click Save. Please note that the Rocket v.3 does not support the S1400 Chassis for our SKUs SYS-G-LSS-WAM, -WAM2, -SUITE, -TTC,-EM. In addition, Rocket v.3 will not longer support the Lightspeed Email Manager. The following video provides a brief overview of changes from Web Filter 2 to Web Filter 3. Browse the course for detailed changes. The Web Filter 3 comes with a brand new stylized interface that makes for easier browsing and navigation. The following is the new default view of the Web Filter. You will notice that it is rather similar to the previous Web Filter 2 view. Web Filter 3 comes with some key navigational changes that make using the Web Filter faster and more effective. Each time you login to your Rocket, you will encounter the Dashboard page. From here you can navigate to Reports, Web Filter, and Settings. Web Filter: Web Filter settings and functions. Settings: Rocket settings and functions. We will predominantly focus on Web Filter and Reports in this lesson, but will also go over changes and new functions in the Rocket Settings. This will pull up the Web Filter page. Similar to other Lightspeed Systems products, Web Filter utilizes a simple navigation mechanism, with a scroll-able menu on the left-hand side of the page. Clicking a page within the menu opens up the corresponding options in the larger right-hand window. The following image shows the Web Filter interface, with the navigation menu highlighted in green and the corresponding options window highlighted in red. Clicking on each page within the right-hand navigation side opens up the corresponding options. The following screen shows the Authentication page selected in the left-hand menu with the corresponding options appearing in the right-hand window. The right-side window will show the options for each category. You can scroll through the options using the right-side scroll bar. Options can be edited in a variety of ways within the Web Filter interface. Other options can be altered by adding or deleting. Click the green plus sign ( ) to add to an option. Click the gray x ( ) in order to delete an option. Other input options include basic text entry and drop down menu selection. Remember to click the green Save ( ) button at the bottom right of the page to save your settings. Important: New to Web Filter 3! You will now have to Deploy your settings. The Deploy ( ) button pushes or “deploys” your Web Filter settings. You have to click the button in order for your settings to take effect within Web Filter. The button is located on the top right navigational menu. When you click the Deploy button, you will be prompted if you wish to deploy the changes. Click the blue Deploy button to confirm. The Authentication layout has slightly changed from Web Filter 2 to Web Filter 3. Authentication functions have remained the same, but the menu has changed. You will still find familiar categories, including the Captive Portal, Access Page, Lifetime, and Exemptions. You will find a new Authentication Sources page within Settings > Global > Tier Management. This allows you to add authentication sources for a variety of directory types, including Active Directory, Apple Open Directory, Google, Office 365, and many others. You can learn more about Authentication Sources here. You will notice that the Proxy Server page underwent some changes. Instead of the Behavior section we now have a Forward Proxy section. This section still shows several behavioral settings, including SSL traffic decryption and the Proxy port. This section now also shows the level of Proxy security and the current Authentication source. Transparent Proxy SSL – This option intercepts and proxies SSL traffic for the selected tier. 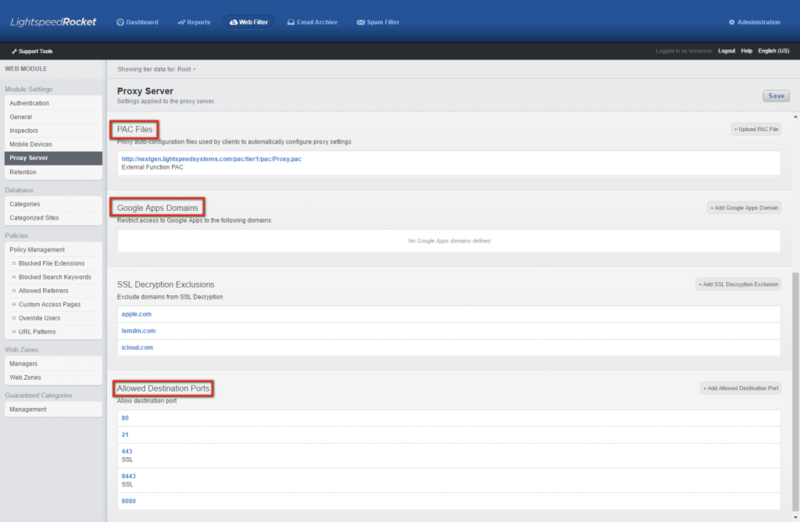 PAC Files – You can add your PAC Files directly from the Forward Proxy page. *Please note that the configuration process for WCCP has changed. You can read more about configuring WCCP with Web Filter 3.2 here. As part of the update, we have significantly simplified the decryption of SSL sites. Before Web Filter 3 SSL decryption presented difficulties on the strictest websites and browsers, confusing end users with multiple pop-up warnings, among other issues. Web Filter’s SSL decryption has been enhanced to be compatible with these websites and browsers, significantly improving the end user experience. Thanks to enhancements on our backend, teachers and students who use the proxy will get fewer warnings and experience fewer issues when accessing encrypted sites. You will also see several unchanged categories showing up in a different order, including Allowed Destination Ports, PAC Files, and Google Apps Domains. Rule Sets, to control how web filtering should be applied to assignees. This documentation will help explain what each policy is and how to add, edit, and delete various policies. Feel free to click the links above, as they will open as new tabs within your browser, or simply come back to this lesson once you are ready to dive into the world of Web Filter policies. We have made significant change to Rule Set options. Rule Sets now have in-depth search engine controls. We have also expanded and improved our database categories. Web Filter reporting has been completely overhauled. Reporting is now better organized by categories and any favorite reports you designate. Web Filter Reports can be accessed by clicking on Reports on the far left-hand navigation menu. Instead of the Reports Gallery, you will see a Network Traffic graph and the various types of reports on the left-side navigation bar. In Web Filter 3, a quick scan of your dashboard will tell you what’s happening on your network, and you can drill down in a report by clicking a widget. You’ll see a live graph of network traffic that toggles to show throughput and requests for the current day; below that, you may see Rocket System Health and other widgets you configure such as: recent search queries, top blocked categories and domains, and top domains accessed — all from the past 15 minutes. First, we’ll go over how to report with the Web Filter. Reporting has been completely overhauled with a brand new interface. You will still find familiar actions, but in new locations. 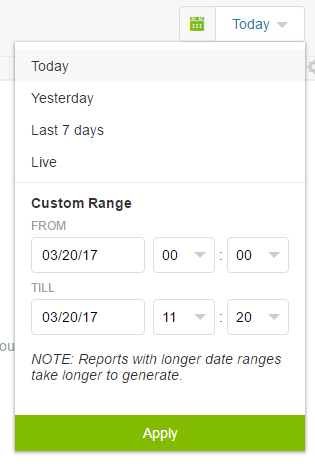 Remember the old reporting view ? No more! The following is the basic report view, in this case, the Blocked Content report under Lightspeed Custom Reports (which is basically an Activity Logs report with the “Blocked” Action selected. The Reports navigation panel, which lets you select different reports as well as create reports is located on the left-hand side and is highlighted in blue. The Time, Date, and Save options are highlighted in red, and the data options and report filtering options are highlighted in green. We will go over each option individually in the following section. Your favorite Web Filter 2 reports may be located under a different category in Web Filter 3. Use this guide to find your favorite reports! 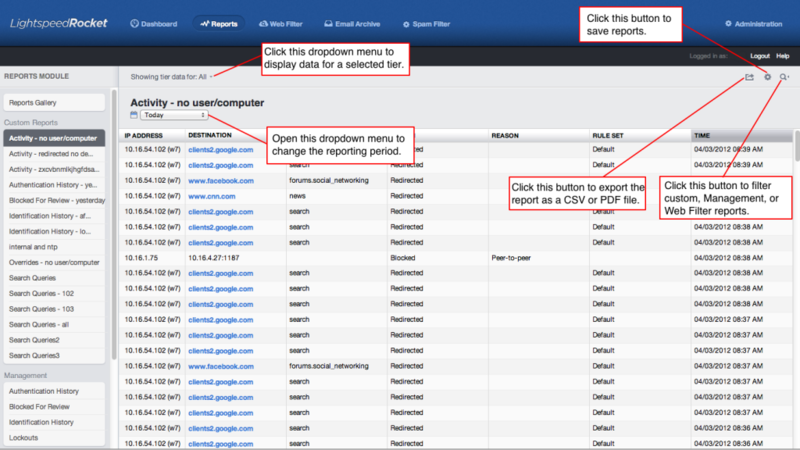 Remember, all Web Filter 3 reports are found in the left-hand navigational menu. Note: Unlike in Web Filter 2, Custom Reports in Web Filter 3 can only be viewed by the Admin that create the report in order to prevent other admins from editing the report and, in larger environments, to prevent schools from editing each others’ reports. The Lightspeed Rocket Administration menu has been overhauled. You can now access the Rocket Administration menu by clicking on Settings on on the far-left side navigation menu. The new Rocket Settings navigation menu is divided into Global and Appliance settings. In both the Global and the Appliance categories, you will find several familiar settings that were previously found under Administration and Support Tools in the Web Filter 2/Rocket 2 interface. The Tier Management page has been overhauled. Instead of navigating tiers on the left-hand menu, the navigation system has been simplified, with the right hand window showing your various tiers. Clicking on a tier, in this example, the Root Tier, will bring up the menu for that particular tier. Here you will find a variety of familiar options, including Settings, Address Space, Subnet Labels, Ignore Lists, Authentication Sources, Administrators, and Local Users. All of these still function similarly to how they did in the previous interface. You can learn more about Tier Management, including how to add, edit, and delete a tier here. A Lightspeed Systems Rocket Cluster is a multi-appliance environment where roles are distributed to specialized Lightspeed Systems Rocket appliances that perform specific tasks, all managed through a single interface. This design provides ease of management combined with scalability and redundancy. 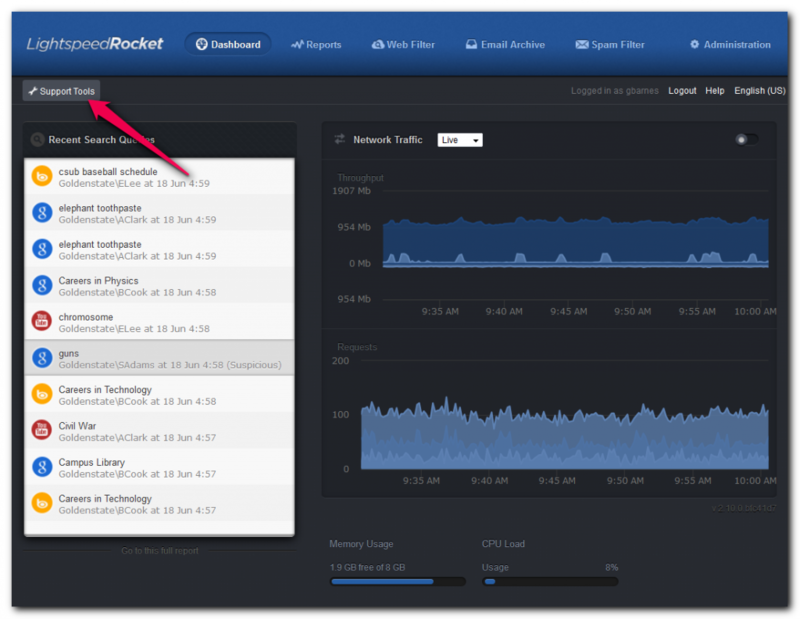 The Cluster management function is new to the Rocket and is only available with Web Filter 3. If you have multiple Rockets in your environment, you will usually have them configured in a Cluster. Learn more about Cluster and its functions here. Auditing allows Rocket Administrators to view logins and configuration changes made by administrators to the Rocket Appliance.The Auditing page has remained mostly the same, with certain navigational differences. Instead of navigating through Auditing by clicking the different tabs, as seen below in the Web Filter 2 interface, auditing functions in Web Filter 3 have taken on a reporting interface. 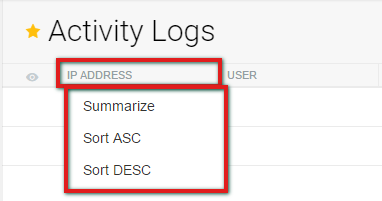 Audits can now be run as reports (refer to the Reports lesson to learn more about navigating and running reports.) Select the date and time by choosing different settings on the right-hand side Data Options bar. You can learn more about Auditing with Web Filter 3 here. The Campus Library, Localization, and SMTP Server subsections have remained largely unchanged. The default Appliance page is the About page. The About page shows the general health and configuration of your Rocket hardware and software. This page can be used to update your Rocket appliance. This page also provides information that can be useful when troubleshooting Rocket issues with Lightspeed technical support. In general, you will find settings and functions that you have previously found on the Software Updates section in the Rocket 2 Administration panel. Learn more about the About page and its functions, including updating the Rocket appliance and setting automatic maintenance here. The Features page has information on your Rocket’s software and network configuration, a list of checkboxes to enable Rocket Roles, and shortcuts to the Licensing and Battery pages. This page is similar to the Server Roles page in the Rocket 2 interface. You can edit the Rocket’s server roles and IP address in the right-hand interface. Learn more about the Features page here. The Backup and Restore page is very similar to the Rocket 2 Backup and Restore page, but comes with a new layout. You can use this page to configure automatic and manual backups, and to restore configuration and data to your Rocket Appliance. New to Web Filter 3, you can now save your configuration backups to our cloud! Prior to this release, users needed to rely on local configuration backups in the event of a hardware failure. The local backup would then need to be copied to the new server. Web Filter 3 users have the option to save their configuration backups to our cloud. With cloud backups, you can simply fire up your new machine, retrieve the backup from the cloud, and restore the configuration. You will find Cloud Backups alongside Local Backups as separate tabs under Configuration Backups and Full Backups. Learn more about cloud backup here. Learn more about the various Backup and Restore functions, including new cloud backup functionality, here. The Network Interfaces, SNMP, and SSL Certificate pages are mostly similar to their Rocket 2 counterparts. The Advanced page has a variety of settings and information previously found in the Support Tools section of the Rocket 2 interface. The section contains a variety of familiar sections, including IO Statistics and Logs. In addition, it contains Expert Settings, which are similar to the Support Settings found under Support Tools in the Rocket 2 interface. This page allows you to control a variety of familiar advanced settings, including activity settings, load balancers, and DNS redirects. Learn more about Advanced Rocket 3 settings here.